Copyright © 2015 National Gallery of Art, Washington D.C. 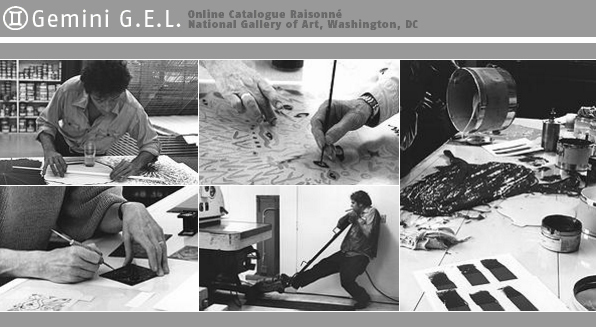 In 1981, the National Gallery in Washington, D.C. honored Gemini with the establishment of a permanent archive. The archive functions as a study center for collectors and scholars. Included in the archive is one proof from each of the over 2300 editions produced, as well as ancillary materials such as shop records and printing elements. Three major touring exhibitions with works from the archive have been organized and exhibited by the National Gallery, and a fourth marking Gemini's 50th Anniversary will be on view during the Fall 2015. The online catalogue raisonné provides detailed information on the history of the workshop and all of the artworks in the Gemini archive.